After the Primetime Emmys, the Governors Ball is Hollywood’s most iconic after-party for nominees and guests. This year’s theme “Emmys Under The Stars”. The source of inspiration this year is the Emmys statuette itself. 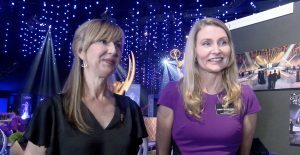 To celebrate the 70th Anniversary of the Emmy Awards, Committee Co-Chairs Tammy Glover Park and Halina Siwolop spoke to WEBN about the changes they are making as the Television Academy hits a new milestone. Glover Park says that the LED light took months and was even assembled in China. Using over 28,000 individual LED lights, 55,000 ft of cable and 600 different lighting instruments, the structure hangs over guests and creates the illusion of a night full of stars. Once the award show is over, guests walk over to the venue and get a chance to experience a more interactive after-party Ditching the usual dinner-style gala, the 2018 Governors Ball structured the space around a dance floor and stage where guests could walk around, interact, eat, drink, and get entertained in both the indoor and out spaces. “My favorite part is to get up and go and find people that I know, congratulate the winners, really mingle about, and so, we think that this new set up will do exactly that,” says Siwolop.